Hawtan Leathers is a leading global leather manufacturer dedicated to promoting sustainable environmental best practices within our organization. We're committed to constantly improving our environmental management systems by reducing water usage, energy consumption, and controlling waste management. Hawtan Leathers believes in fair and responsible commerce and sustainable practices as a platform to help alleviate poverty in Haiti. We work with Haiti Design Coop and Deux Mains and a number of local artisans who employ impoverished women and men at fair trade wages and give them access to safe jobs, sustainable incomes and a chance to determine their own future. These groups strive to create positive change by providing market place access through the fair production and sale of their beautiful and unique pieces made from our leather. We believe that every purchase from The Haiti Design Coop and Deux Mains should be made with a purpose, and that there is nothing more stylish than giving back. Haiti Design Co-op and Deux Mains' mission is to build sustainable partnerships with marginalized groups in Haiti by connecting them to the global marketplace. 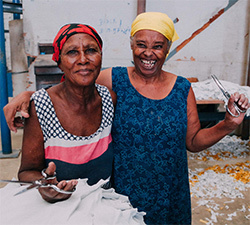 They work to break the cycle of poverty by providing artisans with the tools, training and support needed to reclaim their futures and thrive as independent business men and women. When you purchase handmade, fair trade products from Haiti Design Coop or Deux Mains, you are investing in the future of the people of Haiti. Please click here to visit HaitiDesignCoop.org or click on ShopTribeAlive.org to purchase Haiti Design Coop handbags. Please click here to visit DeuxMains.com and read all about the great work these companies do for the people of Haiti. Fleur De Vie (Flower of Life) is a not-for-profit organization based in New York that works with and supports the initiatives of struggling not-for profit-organizations in Haiti and around the globe whose missions are to implement social change in their communities. Fleur De Vie lends its assistance at a grassroots level by organizing programs that promote transparency and ensuring that the focus remains on benefiting the vulnerable and poor of populations that need it most. This work is done by collaborating with not-for-profits that take action in education, health, and environmental sustainability, areas of concentration that can have the most impact long term. Fleur De Vie is comprised of a team of professionals who, in partnership with a network of like-minded individuals, businesses, organizations, and communities, are devoted to supporting the needs of struggling not-for-profits through fund-raising and campaign promotions. Click here to visit Fleur de Vie online.